In this portrait, painted by the artist in Istanbul, the ambassador has been depicted with a smoking pipe, in Turkish garb, while sitting in an Ottoman style room. The exquisitely drawn minute details of the clocks on the cushion, on which the model is resting his right arm, the floral decorated and bejeweled dagger on the yemeni belt and the string of prayer beads on his left hand, are noteworthy. Count of Vergennes Charles Gravier (1717-1787) was appointed ambassador extraordinary to the Ottoman capital in 1755 and in the same year he became the appointed ambassador. He kept this position until 1768 and throughout that time sought to improve relations between the two countries so as to increase the volume of bilateral trade. 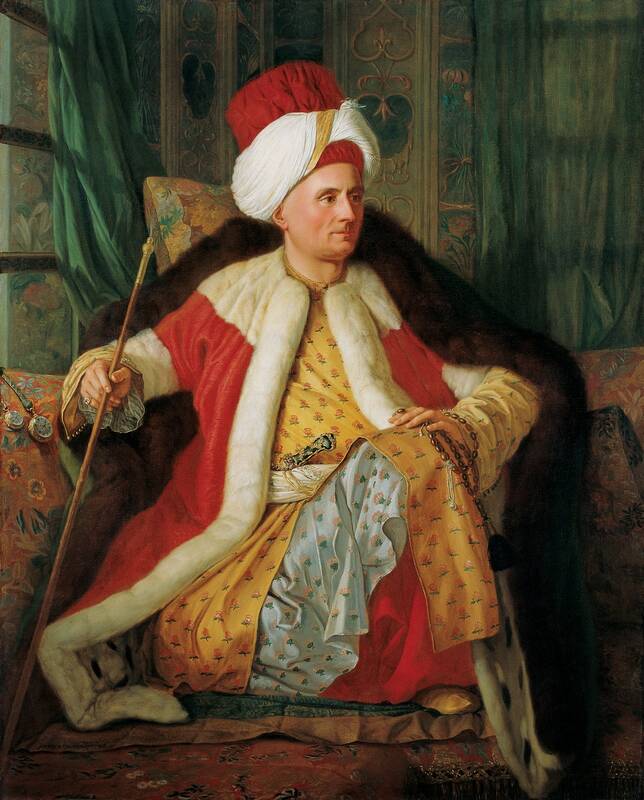 After leaving Istanbul and also because of his success in Sweden, he was made Foreign Affairs Minister during the reign of Louis XVI and was influential in continuing the good relations with the Ottoman Empire. Apart from the reception of the ambassador by the sultan, Favray also depicted a panorama of Istanbul for the ambassador. Scan this artwork with Blippar application and see yourself in the painting!